Four kids, a mini-van and a lot of love: Isn't it time yet?! I LOVE fall and that is no secret! 2. Fire! I love having fires! The smell, the warmth...the ambiance! 3. The crisp color changing leaves! I love taking drives and looking at all the fall colors! 4. Warm cozy slippers! I love slippers and have 3 pair (depending on my mood) I am not a huge fan of socks...but slippers, I love them! 5. Sweat-outfits, any color, any shade...cotton preferred! I love being cozy! One of the main bonuses to working form home. 6. Not enough time in my day, thank goodness for crock pots!! I love starting dinner in the morning, then smelling it all day long and getting to enjoy it for dinner. What are you favorite fall things?! ...anyone interested in it again this year? 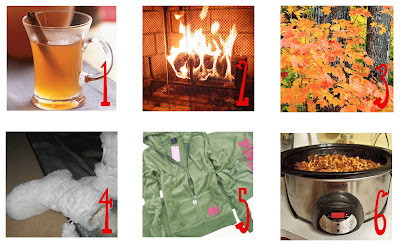 You might be thinking what in the world you put in a fall favorites fall swap box?! Let me know if you'd be interested in joining in?! 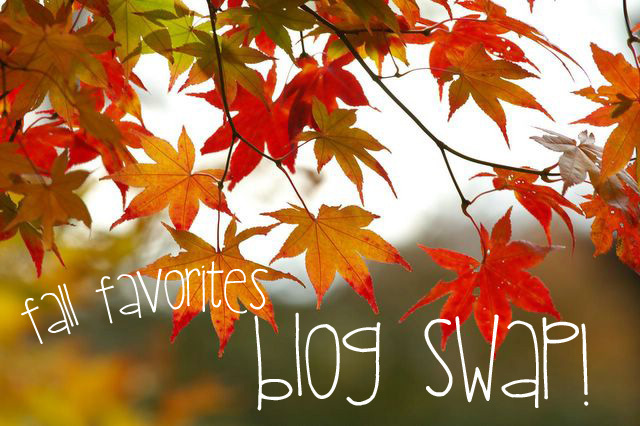 i just participated in a fall blog swap and will be posting on Friday the 14th, however it was my first and i believe an addiction has set in :) EEK!!!! I'd love to be a part of another Fall Swap as I love Fall. So funny. I am not a fan of socks, but love slippers, too!